Libbey's Meat Market offers a wide variety of choice meats, Fresh hormone & antibiotic free poultry, homemade sausage, deli meat & cheese, homemade stocks & sauces along with old-fashioned customer service. Whether you are looking for something quick to put on the grill for supper tonight, doing the week's shopping or planning a special event, Libbey's is the place to have your needs met and your expectations exceeded. Call ahead to have your order waiting (802-626-1029) or come in and spend some time with one of us to get ideas or preparation instructions. At Libbey's, every customer is a V.I.P. Stop by and say hello! Libbey's Meat Market offers only the highest quality beef, pork, lamb, chicken and seafood available from local, western and coastal markets. We also make our own sausages (more than 18 varieties of pork, poultry & beef sausage). Special orders are what we do best, as every customer is special to us. Feel free to call in orders ahead at 802-626-1029 or e-mail us at quality@libbeysmeats.com. We request that you do not leave orders for same-day pickup on voicemail, as we may not be able to check them during service. Libbey's offers a variety of vacuum-packed package discounts. Customers shoud pre-order with three days notice, minimum. Packages include The Lean Machine, 20 lbs. total of beef, pork and chicken meats; Threes Are Wild, 30 lbs. total of assorted meats; Family Plan, 33 lbs. total of assorted meats; The Good Life, 22 lbs. of assorted meats; and Cut A Clod, one whole beef shoulder, cut and packaged to your specifications. Please click here for more details on these packages. OPEN: Tuesdays, Wednesdays, Thursdays & Fridays; 10 a.m - 6 p.m.; and Saturdays, 9 a.m. - 5 p.m. The meat-cutting room closes early, so call ahead if you are running late. WHAT OUR CUSTOMERS SAY ABOUT LIBBEY'S! 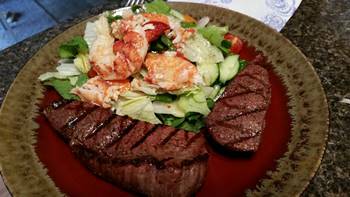 "I have been getting their meat now for several months and it is so fresh and delicious! You can really tell the difference between store-bought and local meats! I will never buy meat from any other place now! They give good service and cut the meats, just like you like them. Oh, and their tomato sauce is really good, too! I use it in my spaghetti sauce." "Best meat in the Northeast Kingdom. Hands down." "Can't explain how delicious all the meat is...you just have to try it! Excellent service every time." 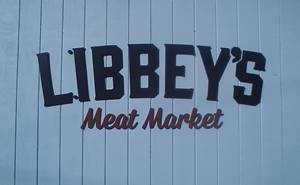 Libbey's Meat Market has been added to your trip.